They say it takes twenty-one years to earn the right to be called a Uilleann Piper - seven years learning, seven years practising and seven years playing. It might also be said that it's only after twenty-one years that you start to appreciate the size of the job you've taken on. The business of learning to play the pipes can drive you to madness or drink or both. Many begin the climb unaware of the level of commitment required to reach, at best, the plateau of competence. It follows that those who, after twenty-one years, have made it to the upper slopes can claim to have earned the right to call themselves 'Pipers' - being accredited masters of the art of 'Pipering'. Taken as a whole these 'Pipers' display many variations of personality. However, in my experience one particular characteristic seems common across the whole order, to wit, a unique self-confidence in their ability, manifesting itself as a personal credo of what constitutes good piping and pipe music. Pipers may be quirky, bloody-minded or lunatical, but they will not have any half-formed or wishy-washy views on the business of pipering. And while they may have consensus on what constitutes the core virtues of good pipering, there is still a huge amount of opportunity for variation and difference of opinion outside of that core. Within the Irish tradition of music there is no single 'correct' way of piping a melody. Rather, the time-served piper has also earned the right to declare (if any non-pipers had the temerity to criticise some aspect of the performance) that, by virtue of that long apprenticeship, any way he chooses to perform it at a given point in space and time is per se the correct way. Every time-served piper's performance is a real-time application of the acquired skills of decoration and the intuitive arts of improvisation put together consciously and unconsciously around the framework of the melody and all contained within the discipline of the cultural tradition. Subject to such factors of variation it follows that no given piece can be reproduced exactly over and over again. Each performance is different. This is why pipers are by nature solo performers. If two pipers sit down together to play the same tune each will play it correctly but differently (curiously enough, the differences of decoration in these spontaneous encounters tend to cancel each other out, producing a rather anodyne skirl). Of course there are occasions when pipers play in multiples, but it is most likely through force of circumstance; it's sometimes done for fun, or to double the visual impact of a gloriously photogenic instrument - but not to create music that has a whole greater than the sum of its parts. What it boils down to is that the pipes are fundamentally a solo instrument, complete in themselves. Whichever way you look at it, it's a one-man show. And this is the key to Leo Rickard's solo album 'Pure Piping'. Leo Rickard has done the full apprenticeship. Like so many other good musicians, he comes from a musical family which has been active in the windswept township of Howth for generations. He started his piping education in 1976 at the old Pipers' Club in Dublin. He has served the full twenty-one and more, playing betimes in groups, family bands, and European touring combos, supporting the sessions and passing on his skills and knowledge to a new generation of pipers at the Willy Clancy Summer School. 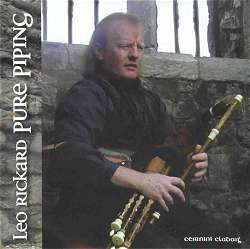 In this, his first full album, Leo has selected a balanced anthology of piping classics well-suited, I suspect, to reflect his personal stance on good pipering, born of that long apprenticeship. In the old days, any discussion of an open piper's qualities would sooner or later pose the question, "Is he a good regulator man?". Leo applies a well-tuned set of regulators on five of the eleven sets on the CD with a fine sensitivity for the critical moment. The old question is answered in its particularity on the final set where he exploits to the full the fact that in The Eagle's Whistle, the first part can be played entirely on the left hand on the chanter, leaving the right hand free to play individual keys in harmony with the chanter melody. In arranging many of the tune-sets Leo has ignored the ceilidh band convention of playing each tune twice; instead he develops a tune through several iterations, introducing new colours and decorations each time. Likewise instead of changing key with each change of tune in a set, several sets are all based on the chanter key-note, as from the older days of piping, delivering a cumulative effect of a single long intricate melody of multiple movements. I was also particularly taken by the two sets of fast hornpipes, in effect slow reels played on the off-beat, guaranteed foot-tappers. Unconventional? Maybe in some ways, but a time-served piper has paid his dues and deserves the respect. It so happened that when I first started playing the CD I was startled, off and on, by some aspect of that personal style; some musical twist or turn that made me sit up. But as it progressed I was overtaken by the thought process I've tried to articulate in the paragaraphs above. I told myself to shut up and listen to what Leo was telling me about his view of Pipering, through the pieces he had selected and the way that he plays them. Rather than mentally trying to shout him down with my views and preconceptions I sat back and let him take me through some old favourite pieces and some that were new to me. At the end of the album I knew I understood more about those tunes, and something about the piper as well. It was almost like having been present at a live performance in some small secluded bar, like the snug at Hughes's. So I congratulate Leo on a fine first album and look forward to the next.